MANSFIELD, Mass. – Taunton’s comeback would probably have been enough to beat most teams in the league, and most teams in the area. But the Tigers learned the hard way that you can’t leave the door open, even slightly, against Mansfield. Taunton overcame a double-digit second-half deficit to take a fourth-quarter lead – its first advantage since the opening quarter – but it was the Hornets that made the plays down the stretch to earn a 61-56 victory. Mansfield held a 15-point point lead (44-29) in the first minute of the second half after Sam Hyland drained a three, and led 50-42 going into the final quarter. But Taunton’s full-court pressure started to pay dividends in the final quarter. Sophomore Prince Brown converted a layup and junior Lou Vendrell (16 points) finished a traditional three-point play to get the Tigers within three. Mansfield’ John McCoy (16 points, five rebounds) snapped the run with a bucket, but Taunton sophomore Dante Law (12 points, nine rebounds, seven assists) took a feed from freshman Diamond Blakely and splashed a three to get the visitors within two, 52-50, with five minutes to go. The three sparked a 9-0 run for the Tigers as Vendrell followed with a triple of his own to give Taunton the lead. Mansfield missed a pair of threes and a putback attempt on the offensive end. 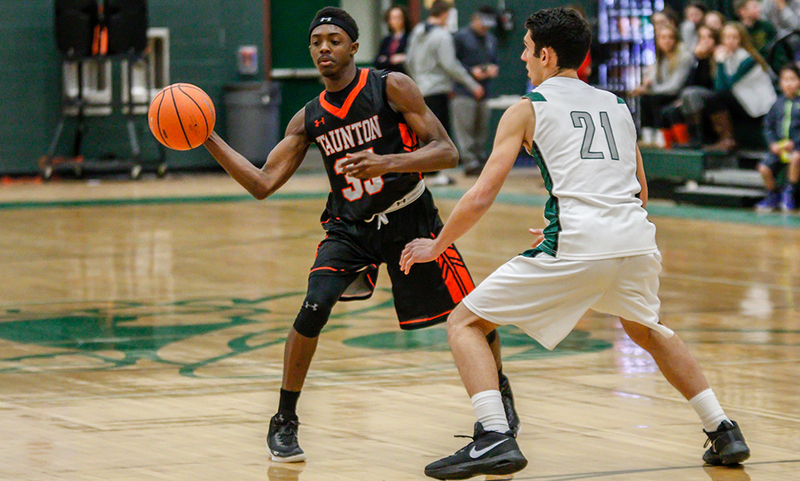 Blakely hit the front end of a one-and-one to create a two-point margin, and senior Lens Esquil (19 points, 10 rebounds) forced a travel with a good defensive play to get Taunton the ball back. Vendrell cashed in on a feed from Blakely to put Taunton up 56-52 with just under three minutes to play. But that would be the end of the Tigers’ night offensively. Despite getting back-to-back stops defensively, Taunton had a turnover on the offensive end and was whistled for a travel on the defensive rebound. Mansfield’s cashed in when Hyland drove baseline for an easy two, making it a one-possession game. The Tigers once again had a turnover with Khristian Conner sniffing out a pass, but the junior couldn’t convert at the free throw line. Taunton went to the free throw line on the other end but missed the front end of the one-and-one situation. Once again, Mansfield seized the opportunity with McCoy taking his man one-on-one and finishing nicely at the rim to tie the game with a minute to go. Taunton’s offense once again went without a shot as a loose ball was pounced on by Hyland, giving the Hornets possession with 42 seconds to play. On the ensuing possession, Hyland ended up with the ball on the way to the basket but after sucking the defense in, he dished to senior Justin Vine in the corner, who buried the go-ahead triple with 21 seconds to go. Taunton’s attempt at a tying three came up short and Conner iced the game with a pair of free throws. “Taunton had a game plan and a method of what they were trying to accomplish,” said Mansfield head coach Mike Vaughan. “I thought we did a good job of dealing with it, I thought they disrupted our rhythm a little bit. We were still able to build a lead and get the ball to drop some. I thought defensively we did a really good job through three quarters and that helped us build that lead. I think their style of play wore on us. I think fatigue, mental fatigue, it all started to kick in. “I think we got the tempo to go our way,” said Taunton head coach Charlie Dacey of the comeback. “We wanted to trap them but you have to be really careful trapping [Mansfield]. Even if you don’t make a mistake and you do trap them, they can send the ball all the way across the court, they are very smart. We were supposed to be trapping in certain places late and we didn’t execute. We had about three straight unwise decisions on the offensive end, and we’re back running our defense against their offense. I thought we did a halfway decent job against them. I don’t think we closed down the three-point shooting very well. It was only fitting for the Hornets that Hyland (13 points, seven rebounds) had the ball in his hand for Mansfield’s biggest possession, just moments after he came up with the loose ball on the other end to give the Hornets possession. For Taunton, the comeback was doomed after the offense struggled after it took the lead. After going up 56-52 with just under three minutes to play, the Tigers had four turnovers, went 0-for-1 from the free throw line (missing the front end of a one-and-one) and missed its final shot after the Hornets took the lead. A back-and-forth first quarter ended with the Hornets up by a pair, 14-12, with five different players scoring for the home team. The separation came in the second quarter when Mansfield outscored Taunton 25-15. The Hornets closed the quarter on an 8-1 surge with buckets from Hyland, McCoy, a free throw from Damani Scott – who scored all eight of his points in the frame – and a late three from Ryan Otto. Otto’s three was Mansfield’s third shot (and third three-point attempt) of the possession after hauling in a pair of offensive rebounds. Taunton cut into the deficit by outscoring the Hornets 15-11 in the third quarter. After going down 15, Taunton rattled off a mini 7-0 run behind Esquil and Law. McCoy had his own 6-0 in response but the Tigers finished the frame with a 6-0 run, with Esquil and Law accounting for all scoring. Mansfield boys basketball (4-0 Hockomock, 6-1 overall) is back in action on Tuesday when it travels to play Attleboro. Taunton (2-2, 5-3) will try to bounce back when it takes a trip to Franklin. Both games are scheduled to tipoff at 6:30.